If you have heard of "Running Man", then this would be no stranger. It is the spin-off of the popular Korean variety show that has got celebrities splitting up into groups and doing a series of missions. They film mainly in China but other countries as well such as the beautiful Prague. At times, celerities guests are also invited on the show to compete with the permanent members. Almost 2 hours of laughter which would definitely lift your spirits after a long day! This show, currently on its 4th series, is highly recommended for all the Dads and young children out there! As what the title says, it brings fathers and their children to places around the country where they spend a few days living every day life. It features a mixture of father-child pairings, from lovey-dovey to fathers who have a sharp tongue but meant well. The raw relationship between each Dad and child is presented and even the minimal interactions shows the fatherly love. One of the best outcomes is how their relationship got so much intimate as the show proceeds on. Ever wonder what it will be like going back to high school when you are already an successful adult in your 30s, 40s or 50s? Well, this show tells you all about it (: A group of celebrities of different ages go back to high schools to find out what it is like studying in this day and age as compared to their own. A number of schools from Shanghai, Hangzhou, Taipei, Chongqing etc are chosen. Hence, the show also brings forward a perspective of high school life in China and its education system. This show is basically about... the brain. It is one to test the brain's limits where the participants face challenges that might deem as impossible to complete. For example, they have to compete between each other to see which picture has an additional dot, among thousands of dots. Participants come from China, Japan, Germany, Italy, Spain and USA just to name a few. There will be many "wows" and "ahhhs" when watching the show but it definitely gets everyone's brains thinking! 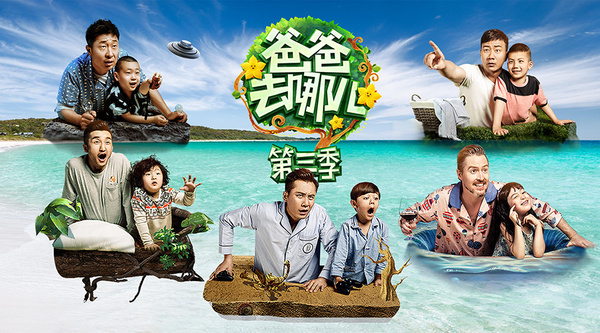 As the title suggest, this show promotes filial piety through traveling with parents. As the celebrities and their parents travel through a foreign country, they will play games, learn cultures and bond deeper with mom and dad. It is also a chance for the sons and daughters to express their gratitude to their parents. What they say is always true, that no matter how old you are, you will always be a precious child to your parents. These shows could serve as inspiration to the activities you can do with your family (: Celebrity of not, always remember to spend time with people who love you!